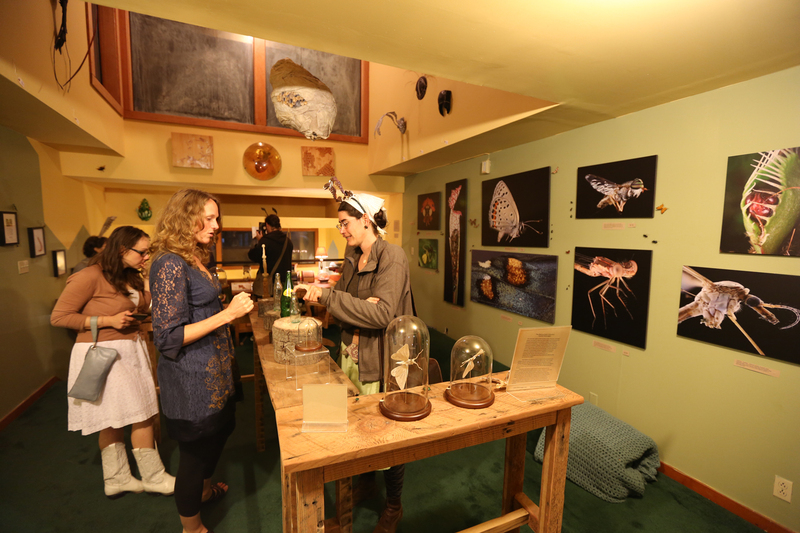 Last Saturday's opening of The Surreal World of Insects at Terraria was a total hit. More than a simple wine-and-cheese affair, it became a huge party of insect artists and natural history enthusiasts that lasted long into the night! The show will be up for at three more weeks, and if you're near Berkeley, it's worth a visit. The gallery space itself is something of an insect artwork. Terraria boasts a stunning giant bee-filled mural by Ana Bonfili, that pulls in the natural light and gives context to the riot of natural goods and terrarium-making supplies that line the store. 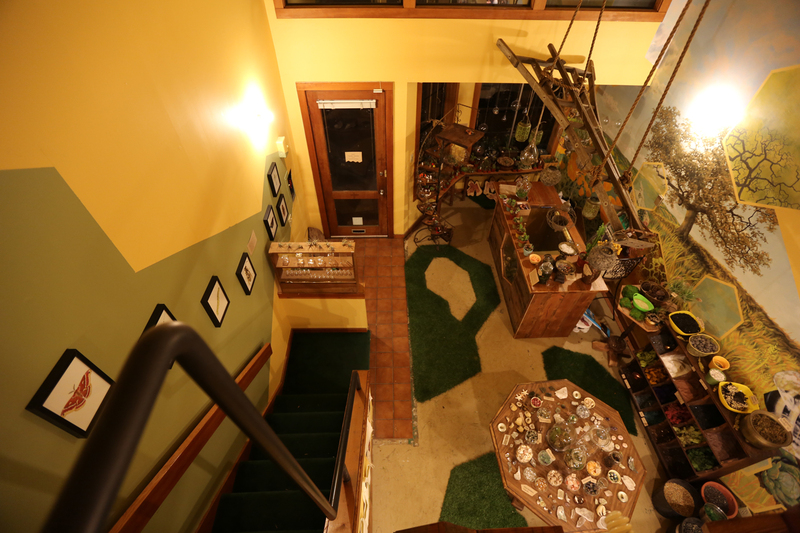 Handcrafted wooden hexagons made by owner Olivia Wright and her fiance Kevin Bento cluster about the walls, making Terraria a welcoming hive for the visiting artworks. A series of serene insect illustrations by museum exhibit designer Tami Stewart line the staircase, giving way to two large photo exhibits above. Nature photographer Becky Jaffe coaxes character out of her subjects, catching orthopterans and mantids in moments of contemplation. Her photos are accompanied by appreciative insect poetry as well as stories from her travels. Turning up the magnification are Pat Hollingsworth's intimate macro photos of butterfly wings and crane flies, as well as carnivorous plants gorged on insect carcasses. Sharing a table with Colleen Paz's engaging push-button moth bottles are a series of fantastic specimens from curiosity cabineteer Danielle Schlunegger. Beeswax, dried plants and scraps of old text are given new life under her glass domes, congealing into imaginary insects and bizarre larvae. Andrew Werby's digitally-crafted wood carvings suggest small invertebrate totems, or perhaps relics of an locust-worshipping cult long vanished. Along with three of her oil paintings, Kristen Rieke's great paper-wasp nest hung ominously above the room. More than a few attendees eyed it with suspicion, as if some papercraft hornets might plume forth at any moment. And of course high overhead were some of my cardboard and plaster masks, musings of how other ancient cultures would have represented the microscopic world, were they to have had access to high-powered lenses. Outside in the back yard space Olivia placed my giant bronze insect LEG near the entrance, which is pretty threatening at nearly five feet in height. 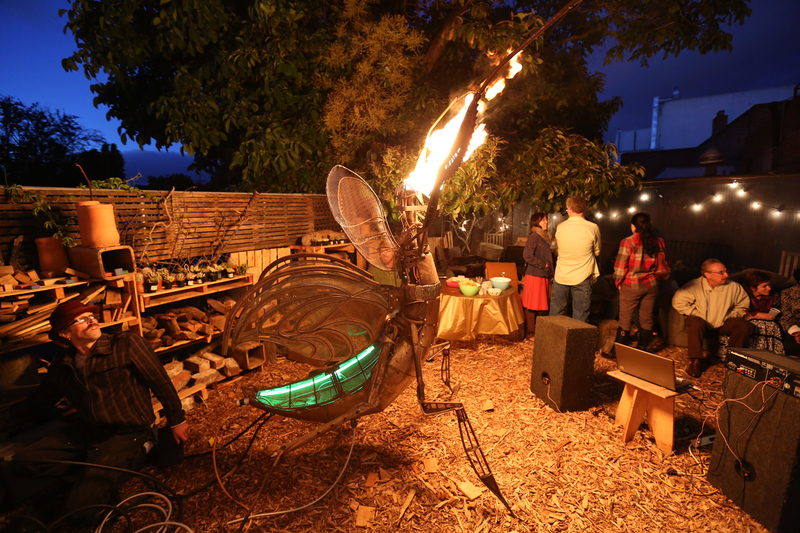 But it was nothing compared to Todd Cox's Praying with Fire, a toweringly huge and intricate steel mantis sculpture made of custom-welded steel and neon, with jets of propane-fueled fire in place of antennae! FAWOOSH! My great green grasshopper cart made an appearance too, full of cardboard antennae for people to wear or purchase. Olivia had even set up a photo booth so people could get their portrait taken with their new sensory appendages. As the sky darkened, a projector played Microcosmos on a wall while folks waggled their antennae, snacking on cupcakes arranged like caterpillars. The film is only an hour long, but by popular demand it played repeatedly for the insect-loving crowd, as folks settled into outdoor couches and warmed themselves by the heat of the great flaming mantis, their eyes lit up by the gouts of propane light like so many glittering compound eyes. This entry was posted in art, event, JD and tagged Ana Bonfili, Andrew Werby, Colleen Paz, Danielle Schlunegger, Kristen Rieke, Olivia Wright, Pat Hollingsworth, Tami Stewart, Terraria, Todd Cox. Bookmark the permalink. thenoidbag: The height of my creative powers.